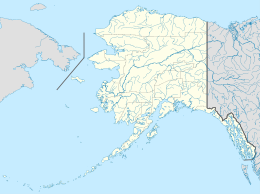 The Near Islands or Sasignan Islands (Aleut: Sasignan tanangin) are the smallest and westernmost group of the Aleutian Islands in northwestern US State of Alaska. They are located within the Aleutian Island chain to the west of the Rat Islands but to the east of the Russian Commander Islands. Map of the western Aleutian Islands, showing the Near Islands on the left: Attu Island (1), Agattu Island (2), Alaid Island (3), Nizki Island (4), and Shemya Island (5). The largest of the Near Islands are Attu and Agattu, which shelter a few rocks in the channel between them. The other important islands are the Semichi Islands to their northeast, notable among which are Alaid, Nizki and Shemya. About 20 miles to the east-southeast from Shemya are small rocky reefs known as the Ingenstrem Rocks. The total land area of all of the Near Islands is 1,143.785 km² (441.618 sq mi), and their total population was 47 persons as of the 2000 census. The only populated island is Shemya; the U.S. Coast Guard station on Attu closed in 2010 and all inhabitants left the island later that year. The islands were named Near Islands by Russian explorers in the 18th century because they were the nearest of the Aleutian Islands to Russia. They are the farthest of the islands from mainland Alaska. During the Second World War, the Japanese Imperial Army occupied the Near Islands in 1942. American forces retook the islands during the Aleutian Islands Campaign in 1943. United States troops hauling supplies on Attu Island in May 1943.